You wouldn't expect a show on which zombies are stabbed in the head nearly every episode to be a bastion of social conservatism. 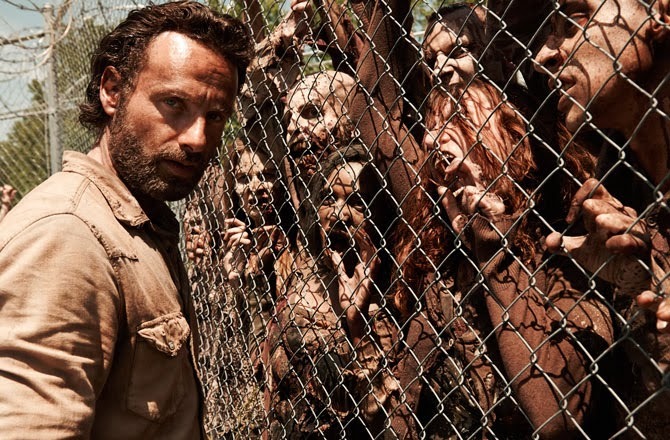 But that's just what's up right now on The Walking Dead, and it's significant because it's the highest-rated TV show with US viewers ages 18-49, amazing considering you have to subscribe to cable, satellite or an online service to get it. It's a cultural phenomenon that so far hasn't inspired much of the hand-wringing analysis of Breaking Bad, or the shot-by-shot tweets of Mad Men. But those shows, combined, don't equal its audience. 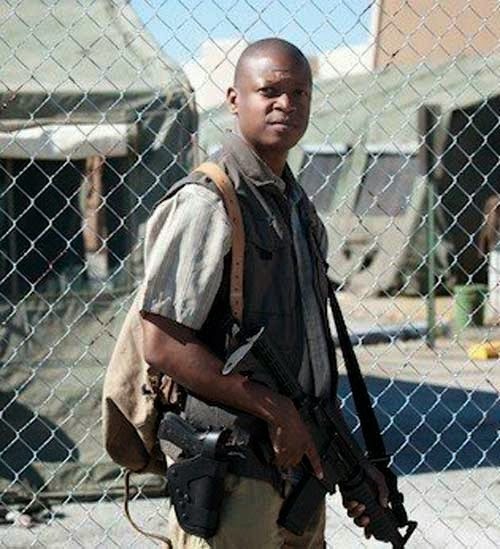 In the season premiere, a new character, former army medic Bob (played by Lawrence Gilliard Jr.), goes with some of the returning characters on a supply run. In a grocery store, he picks up a bottle of wine, and looks lustfully at it. We know it's trouble. Then he decides to put it down. Good for you, Bob! God forbid you would want to drink a bottle of wine when you're living in a prison during a zombie apocalypse. But when he puts it down, he knocks over the whole shelf of wine. Wine bad! Deadly wine! It traps his foot. Wouldn't it be his just reward if zombies ate his intestines in front of him? After all, he did briefly consider taking a bottle of wine. Hey Rick, is it Happy Hour yet? No -- it's worse. In trying to rescue him, some character we hadn't seen before this episode, whose name I believe was Zachary R. Victim (his previous scene was his girlfriend telling him she wouldn't say goodbye before the supply run), gets caught by the zombies and eaten alive. Wine bad! See, it won't just kill you -- it'll kill some hapless extra! I let that one go, but after this week's episode about Bob's Deadly Alcohol Problem, I just have to rant. Bob goes on another supply run to a veterinary hospital. He's the only one with medical experience. He pauses, searching an empty office, during which time he apparently finds a bottle of Cognac and puts it in his backpack. Bob leads the others in finding the right medicines -- and I have to think this line is meant to be significant. "Anything that ends in sin, cin, like penicillin," he tells them to take. Our heroes grab bottles of pills and other medical equipment. Then the zombies attack; that's why they call the show the Walking Dead. Our heroes have to run and fight and cut off some zombie limbs, but they're all show regulars, so we feel pretty confident they'll make it. Eventually they have to jump through a window onto a ledge, with zombies below. The zombies below have a grip on Bob's backpack. He's wrestling them for it. "Let it go," the others are yelling. Bob won't let go. Finally his rather slow companions help him get the backpack. One of our heroes opens the backpack and -- voila! -- there's no medicine except a bottle of Cognac (which I would consider useful for any number of ailments during a zombie apocalypse.) Because clearly, when you have a bottle of Cognac in a backpack, there's no extra room even for small bottles of pills. Bob puts his hand on his gun; don't take my Cognac, I'll kill you! Another character, fan favorite Daryl, gets in his face. There's a macho staredown. Earlier Bob told Daryl his terrible story about how, since he watched two groups of friends die, sometimes he likes to drink at night to help him go to sleep. And how he thought about bringing a bottle to the prison. Now our hero Daryl tells him how wrong he is for wanting this bottle, and he'll be watching him. Cognac bad! Worse than zombies! It kills your friends! Did I mention that this is the top-rated show with American adults 18-49? Great post, but let's be clear--people (not wine, not zombies) are ultimately the real threat. I know nuance tends to get lost in our culture, but the mass-success of The Walking Dead, as dark as it is, gives me optimism.